After uploading your data, you have multiple options to enhance the quality and storytelling qualities of your line chart through customization options. In this tutorial we describe how to make a beautiful chart in three steps. You will learn the various options Datawrapper provides to create an outstanding, narrative with just one element in your publication. Line charts can be the basis for a complete article, specifically when you report about a development over time. We will go through three tabs in step 3: Visualize to change the appearance of ou chart: " Refine", "Annotate" & "Design". In the "Refine" and "Annotate" tab, you can resize the chart, to make it wider or taller. To do so, click, hold, and drag the arrow in the lower right corner to scale the chart window. Custom range: Maybe you want to show another time range than the one you see. You can extend your time range (e.g. if you have data for the years 2000 to 2016, you could extend the range to 1990 to 2020), but you can't limit the time range. Datawrapper will always should the whole time range that it can find in your data. Even if you choose the time range 2013 to 2016, our tool will still show you the data (and therefore the time range) between 2000 and 2016. If you want to limit the time range, you need to delete data, e.g. in step 1: Upload data. Custom ticks: Here you can decide which ticks you want to see. If you type in "2000, 2005, 2006", only three gridlines will appear at the x-axis positions 2000, 2005 and 2006. Tick format: Here you can decide which kind of ticks you want to see. 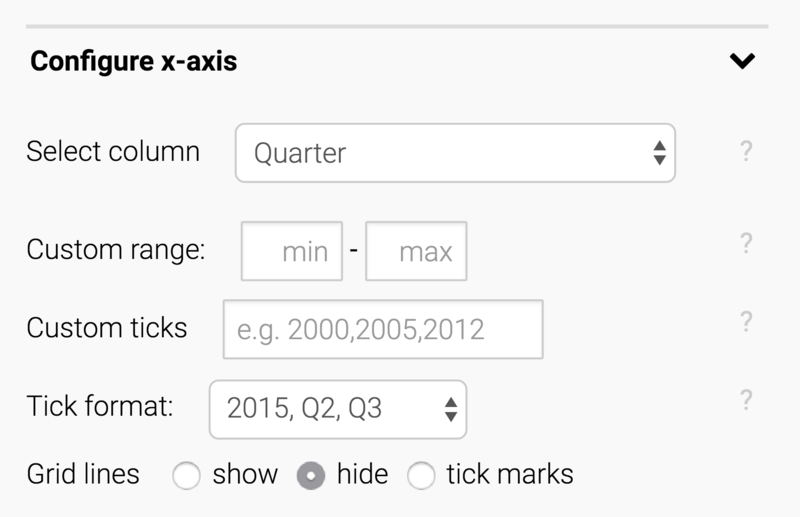 We have quarters data and two options in the drop-down: "2015 Q1, 2015 Q2" and "2015, Q2, Q3". If we choose the first option, we will see ticks like "2015 Q1" and "2016 Q4" below our axis. Datawrapper won't display ticks for each of our quarters, because the space is too limited to do so. A better idea is the "2015, Q2, Q3" option: This will display just years below the axis (2014, 2015, 2016 etc. ), but we will see the quarters in the tooltips: "2014 Q1" for example. Grid lines: This setting is straightforward: Do you want to show or hide the y-axis gridlines, or just show the marks? Scale: By default, your linear chart will always appear on a linear scale, where the difference between 1 and 2 is as big as the difference between 100 and 101 and 1000 and 1001. However, if you have important differences in your small numbers and large differences in your big numbers, a logarithmic scale might be the better alternative. If you choose it, the difference between 1 and 10 will become as big as between 0.1 and 1 and 1000 and 10,000. Custom range and custom ticks: Explained above. Choos the number format "0%" or "0.0%" if you have a number that is a relative number. This setting will add a percentage sign. 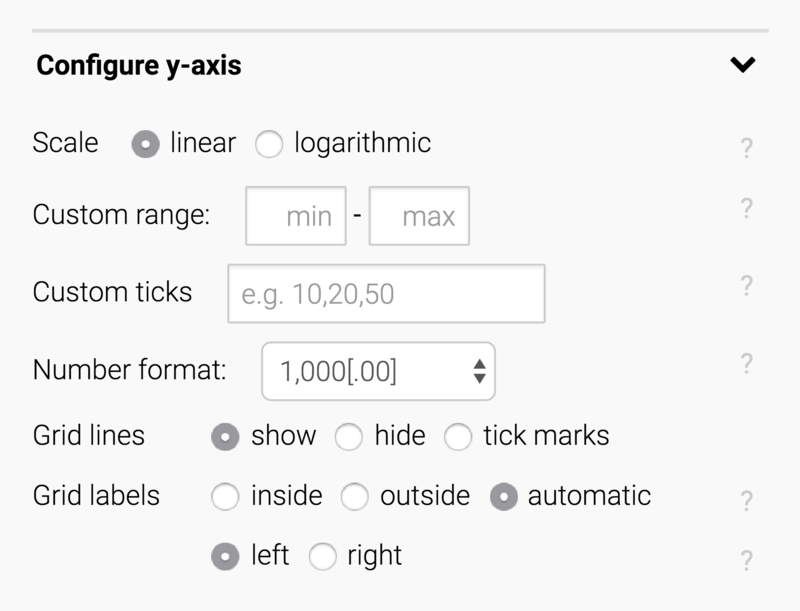 Grid labels: Here you can decide on the design of your grid labels. Should the stand outside or inside, or should that change depending on the available space ("automatic"?). 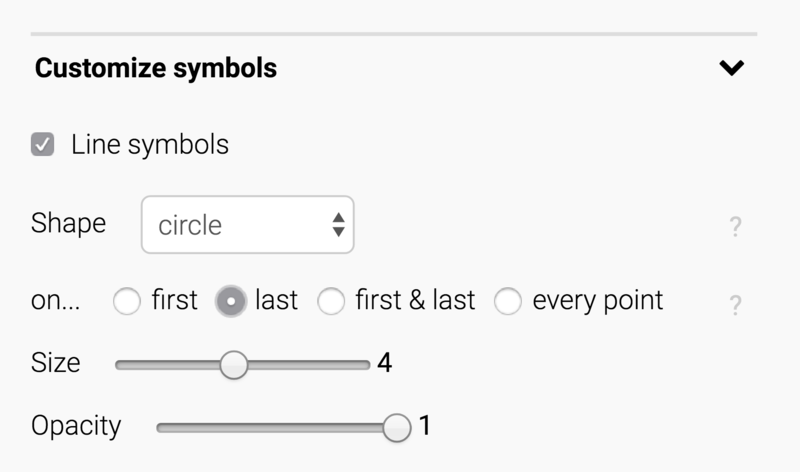 You can also decide if the grid labels should stand left or right of the chart. You can also see that we can change the interpolation – meaning, how the lines are connected between the data points. To read more about when to choose which interpolation, visit our blog post. In this fourth label, we can decide where the line labels ("iPhone", "iPod" etc.) should stand: On the top, on the right, or shouldn't the be displayed at all? The last option can be useful if you want to directly label the lines with annotations (which you can set in the next tab, "Annotate"). These are all the options you can find in the Refine tab. Let's move on to the Annotate tab. Here you'll find three options: "Annotate your chart", "Text annotations" and "Highlight value ranges". 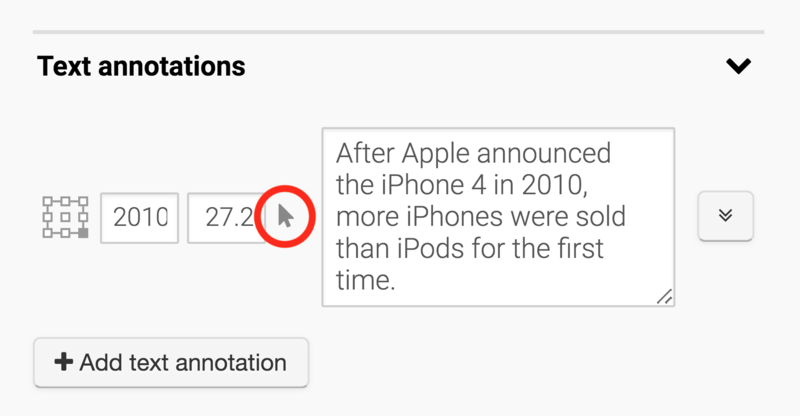 If you'd like to learn more about this powerful feature and how to precisely set and format annotations, visit this tutorial. In this last step, you can select a preset layout and enable social sharing functions to spread your work. Users of the free plan or Single users have two options: One layout with and one without the "Get the data" link. Users of Datawrapper Team are able to select a custom layout here. Congratulations to your finished line chart! In this last step, you can publish your work and decide how to share it with the world. The best way to use a Datawrapper chart is by embedding it directly on your website. To do that, click the big blue button that says "Publish Chart". Then, copy & paste the embed code snippet into your website or CMS. You can also download your chart as a PNG or PDF by upgrading to a paid Single or Team account.